How do I order my register cover? Simply fill out an order form and send it in and we will contact you to confirm and finalize your order. It’s that easy! You can fax your order to (503) 232-0706, email it to bill@stonecenterinc.com, or snail mail it to us at 1504 SE Woodward St., Portland, OR 97202. How long will it take to receive my register cover? Once we receive your tile (s), we will need about 4-5 business days to make your register. We’ll give you a final timeframe at the time when we contact you to confirm your order. How will I receive my register cover? If picking up your order locally, we will contact you when it’s done and ready for pickup at our Portland, Oregon location. If you’d like us to mail you your register, the charge is $20 for a single register cover plus $5 for each additional cover. We will contact you and provide a tracking number when we send out your package. We can make registers from marble, granite, travertine, slate, porcelain, and ceramic tile, even wood. We generally work with customer provided material as it allows the best match to the floor tile. If you’d like us to source material, however, we can do that too. Just contact us for a custom order. How much material do I need to send? This depends on the size of register we’re making. See the chart below. We suggest you send at least 2 tiles to account for possible breakage during the cutting process. How thick should the material be? We generally work with standard tile thickness which is 3/8”. However, we can work with other material thicknesses. It will just change the thickness of the finished register cover. We back all our covers with 3/16” aluminum for added strength. 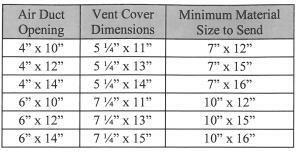 I don’t see my vent size listed. Can you do custom sizes? Of course! Just fill out the information on the attached form and we’ll contact you with a price for your custom order. What if I want a different design? We love creating new things and would be happy to work with you on this. We can either work with your design ideas and files if you have them, or you can take advantages of our design services to come up with the perfect design for your space. Are marble/granite/limestone/ceramic register covers really strong enough to walk on? Absolutely! We back every register with 3/16” aluminum plate for added strength. When correctly installed, your custom heat register cover is a durable, highly crack resistant part of your floor.